← Girls of the Bone Yard 2015-16 Calendar Available! Christmas may have passed, but L.A. ZOO LIGHTS is going strong, WITH MORE THAN 150,000 TICKETS SOLD SO FAR IN ITS DEBUT YEAR. L.A. Zoo Lights remains open nightly through January 4, INCLUDING NEW YEAR’S EVE! Featured on Wednesday, December 31, 6 to 10 pm, is A VERY ANIMATED NEW YEAR’S EVE, inviting guests to ring in the new year family-style with screenings of critter-filled DreamWorks Animation classics including Shrek the Halls, Dragons Gift of the Night Fury, Merry Madagascar and Kung Fu Panda Holiday throughout the evening. Zoo dining facilities and snack bars are open. Admission to L.A. ZOO LIGHTS is $13 for adults/seniors and $11 for children ages 2 to 12; tickets for GLAZA members are $12 for adults/seniors and $10 for children ages 2 to 12; children under age two 2 are free. 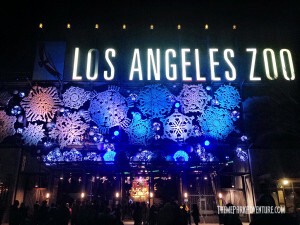 This holiday season for the very first time, the Los Angeles Zoo has changed stripes from a daytime adventure to a dazzling winter wonderland known as L.A. ZOO LIGHTS, which captivates guests as it transforms the Zoo’s enchanting environment into a series of awe-inspiring animal escapades rendered in led lights, lasers, 3D projections, spectacular sets and interactive displays. Open through Sunday, January 4, 2015, 6 to 10 pm, this magical new experience is destined to become a wondrous, “don’t-miss” holiday tradition. Special effects include 3-D holiday/animal-themed animations, freeway-driving “animals,” a group of giant “bullfrogs” made from 3,750 water bottles lit from within, giant floating snowflakes, glittering light tunnels, animal cutouts, icicle lights and much more. This entry was posted in Home Page, Home Page Slider, News and tagged L.A. Zoo Lights. Bookmark the permalink.